Upgrade the data paths of your local wired network to information superhighways with the Linksys LGS116P 16-Port Business Gigabit PoE+ Switch. 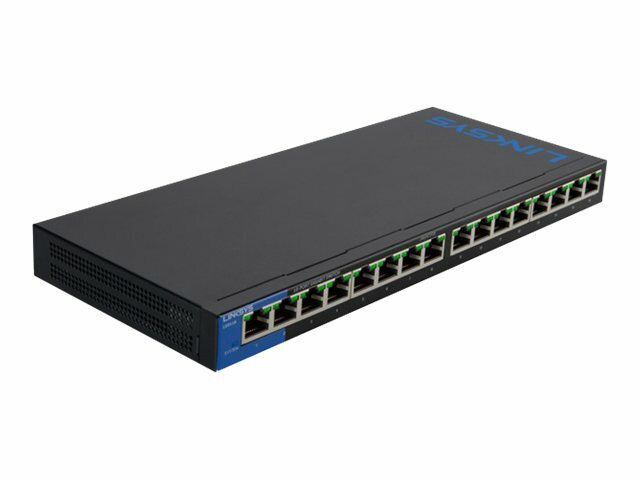 Offering 16 gigabit Ethernet auto-sensing ports with wired connection speeds up to 1,000 Mbps, this unmanaged switch lets your small business expand its local network and send large files to servers, drives, and printers at gigabit speeds. 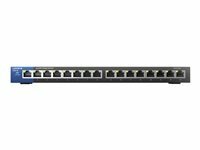 Power over Ethernet Plus technology allows you to send power to devices like IP telephones or video surveillance systems through Ethernet cables without having to install separate power supplies to those devices. These unmanaged PoE+ switches offer Gigabit speeds to minimise transfer times and greatly enhance the ability to stream high-bandwidth files to connected devices without interference. QoS traffic prioritisation gives precedence to particular devices or activities to ensure mission-critical data throughput is maintained regardless of network congestion. Auto-sensing ports automatically optimise speed for each connected device.